On the 23rd of March, all roads lead to Pabloz Club and VIP as South Africa’s renowned Disc Jockey and producer Themba Sonnyboy Sekowe popularly known by his stage name DJ Maphorisa jets into the country for his maiden performance. Speaking to 263Chat, Pabloz DJ, DJ Juice confirmed that Maphorisa will be performing at the club adding that they will hosting more of these events this year. “More DJs from outside Zimbabwe will be coming and people can look forward to more royalty, more amazing events, album and video launches, local performances in the club; our own artists and DJs. If Cassper Nyovest can fill up a stadium with almost 68 000 fans what is stopping us from doing and that is our aim,” he said. He said they call themselves the Royal DJs (DJ Juice and DJ A.M) because everyone wants to be part of royalty and first family. “And if you dress good, look good, smell good you are royalty, on the side its called Royal family because when I look at the people that walk into Pabloz I don’t look at them as clients but family because of the way they carry themselves,” emphasized Juice. Pabloz has hosted South African artists like Heavy K, Prince Kaybee, DJ Nadia Nakai and DJ Shimza, they also host glamorous parties like the Golden Ball, Suit up and All White parties with the who’s who of Harare with the likes of socialites like Ginimbi. 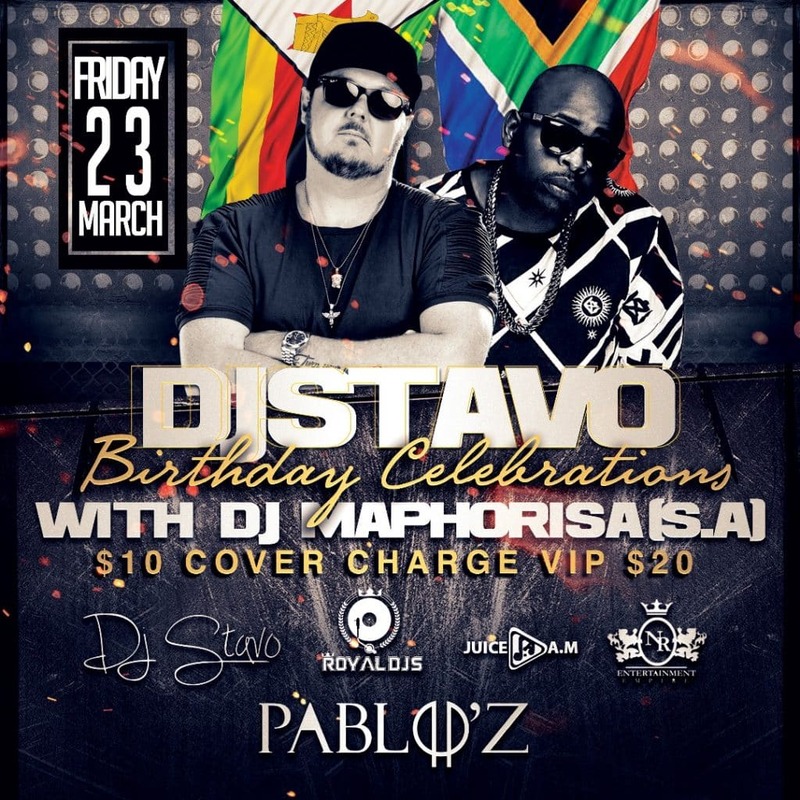 The show will also be in collaboration with DJ Stavo’s Birthday Bash. DJ Maphorisa is also known for hit tracks like Particula, Midnight Starring, Soweto Baby to name just a few.